A little over two years ago when I was training for my first half marathon, I could never kick the feeling of being tired. No matter how much I slept-- and I sleep A LOT-- I was always having trouble getting moving and actually waking up, no matter what time of the day it is. My workouts felt slower than they should have been, and I was overall just feeling, “blah.” I went to the doctor, who ran a few blood tests, and told me, “Your iron is low. But you’re fine.” That was it. No recommendations on what to do more (or less) or, just that I’m fine. Thanks Doc. After feeling disappointed about the lack of knowledge I gained from my PCP, I took a trip to see my good friend and dietician, Tara (A.K.A. The Plate Coach). After walking her through my training, eating, and recovery routine, she gave me a bunch of great tips about how to properly fuel while training. While I had been an athlete my whole life, sometimes playing on two soccer teams and one softball team at once, I had never really put thought into what I was eating on and off the field. Mom, if you’re reading this, thanks for always keeping me well fed (although my favorite snacks at soccer practice were always orange slices and Kit Kat bars)! Although Tara dropped a lot of knowledge on me (did you know a serving of avocado is like 2 slices?!) I still wanted more answers. Despite my awesome organizational skills, I’m terrible at food logging, and there was only so much information self-reporting could get me. After listening to Jon talk my ear off about InsideTracker for a few months, I decided that not investing in my health was stupid, and I was going to give it a shot. For those of you not familiar, InsideTracker is a simple service that gives you a lot (like almost too much) knowledge about your body and what it needs to perform the best that it can through your blood. You choose a plan (they are based on the amount of biomarkers you want tested), get a quick blood test, then 2-5 days later, you receive your results. You don’t only get the numbers of your biomarkers and what range you fall into, but you also get recommendations based on your results… and they’re not crazy recommendations, but simple ones such as switching blueberries out for raspberries. These recommendations get tweaked even more based on the goals that you choose (like sleeping better or getting faster), proving that everybody (emphasis on the body) is different and no two people are alike. This first test revealed that my iron was low, as my PCP told me, but my ferritin specifically needed help. Without getting too nerdy, ferritin is a protein that stores iron, which makes sense why I was always tired. To increase my iron, InsideTracker suggested things like old fashioned rolled oats, dark chocolate (yes please), mussels, peanut butter (again, yes please), and oysters. I also found that my cortisol (stress indicator) and glucose (blood sugar) were high, giving me a few more things to focus on. 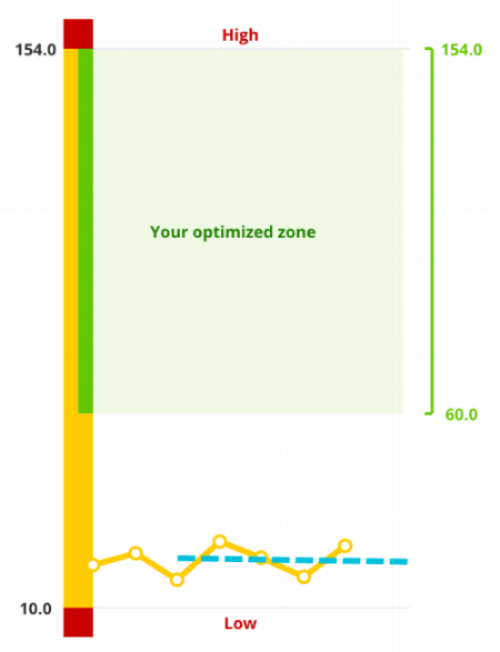 One day I'll get into the green zone! Another great (but scary part) about what InsideTracker offers is their InnerAge calculation. According to The Vampires at InsideTracker, Innerage measures 5 key biomarkers that contribute to aging so that you can see your real age from the inside out. In addition to these biomarkers, your InnerAge also depends on your body composition and physical activity. While I was 24 when I first tested, my InnerAge was almost 29! ALMOST 29! This gave me a nice reality check that I’m not as healthy as I thought I was, but thankfully InsideTracker gave me a list of 5 foods to add to my diet to help me get back to my real age (and even younger). After 7 sets of data points in front of me (that's testing once a quarter or so), I’m finally figuring out why I feel the way I do and where I need to focus my efforts. I feel like I learn more and more every test, and the puzzle pieces are starting to fit together. Overall I’ve found that I wasn’t eating enough, and omitting some things just because (like drinking almond milk instead of whole milk) wasn’t doing me any favors. On any given day, I can scroll through social media and see someone talking about some great new diet or something they’re never eating “ever again,” but the truth is, there’s no one size fits all for fueling. Even though I’m not in my normal training mode right now, I decided to take an InsideTracker test to see where my body’s at-- one month without running, two months without running as much as I normally do-- and what I can do to get it in the best place for when I come out of retirement. For as much as I love data, and the help InsideTracker gives you to figure it all out, it would be silly of me to not take this downtime to get my food and supplements in order. Thankfully I have a handful of things that are optimized and in a good place, but I still need to work on my iron (forever and always), glucose, Vitamin B, and cholesterol to name a few. ...And my InnerAge is now 35.7, so that’s great! Bring on the avocado, almonds, soybeans, sunflower seeds, and coconut. After talking to one of InsideTracker’s nutritionists (hi Ashley! ), I have another list of things to incorporate into my diet: beans, hemp seeds, walnuts, whole-fat dairy, and as always, oatmeal. I’m committing to taking the next few weeks to tuning a bit more into my body, what I’m eating, and what I’m lacking, to make sure I’m in the best place possible for the next round of training. And with that, comes a verbal to blog more about what I’m cooking (this is twice in the past two posts I’ve mentioned food blogging, so I better stick to it!) -- if you don’t have a crockpot, please purchase one now. Nothing like a little surf and turf. Because #science. If you’d like to join me on the InsideTracker train and let my favorite vampires teach you how you can feel better inside and out, feel free to use the code “JENNA” for a nice deal. Disclaimer: Although I am dating one of The Vampires, I promise Jon’s not the reason I love it so much!